Your brick appears to have the yellow clay that probably came from Ione and white quartz grog, also from Ione. These are not found in the original Carnegie brick made at Carnegie, CA. 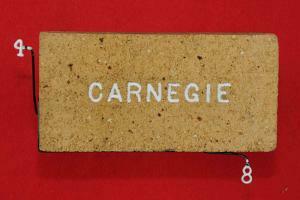 These instead are typical of the bricks made by the Stockton Fire Brick Company, which continued the Carnegie line of brick after the demise of the original Carnegie plant. The question is which Stockton Fire Brick Company plant was this brick made at? It was either at their Stockton plant or at their Pittsburg plant. Your brick from the photo appears to be made by the dry-pressed process, as opposed to the wet mud extruded process. So, based on that, if I interpret the photo correctly, I would be inclined to point to their Pittsburg plant. So this brick probably was made sometime between 1920 and 1932. It does not have any features that would indicate Gladding, McBean & Co. Thanks for the link to your web site. I look forward to seeing it.